Susan Ely, who leads the county attorney office’s criminal division, said the 38-day sentence was the result of negotiation and that Heimbach could serve the remaining 52 days if he re-offends again. “We wanted the absolute guarantee that he went into jail today,” Ely said. 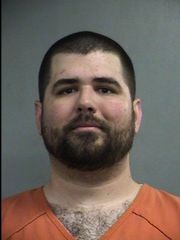 Sheriff’s deputies handcuffed a smiling Heimbach with his hands behind his back and escorted him to the jail. Jay Lambert, Heimbach’s public defender, said the Indiana case is still pending and that Heimbach’s agreement with Louisville prosecutors does not mean he’s pleading guilty to the new charges. “What we structured here was a mechanism where Mr. Heimbach did not admit to any factual wrongdoing, but he acknowledged that there was sufficient evidence to revoke him had he gone through the hearing,” Lambert said. Reporter Matthew Glowicki can be reached at 502-582-4989 or mglowicki@courier-journal.com. Support strong local journalism by subscribing today: http://www.courier-journal.com/mattg. Matthew Heimbach has been sentenced to 38 days in jail after a Louisville judge revoked his probation. Heimbach, leader of the white nationalist group Traditionalist Worker Party, was charged with misdemeanor harassment in Jefferson District Court after he repeatedly pushed a woman at a Donald Trump campaign rally in Louisville in 2016. Heimbach pleaded guilty to an amended charge of second-degree disorderly conduct in July 2017, agreeing to attend anger management classes. 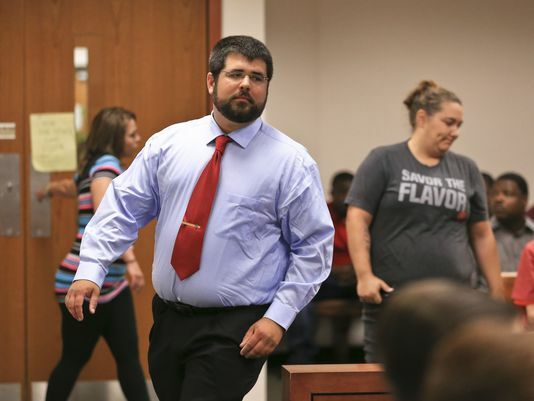 The Jefferson County Attorney’s Office moved to revoke Heimbach’s probation after he was charged in Indiana earlier this year.